Ex: 1000 coins x 200 ICO's = 200,000. Does that mean that the original number (of say 1000) will increase to 200,00? I can't find anywhere on the OneCoin site that can help with further info. Does it also mean that the total value of 200,000 ICO's will depend on the opening price in October? You changed ONE to OFC on the promotional rate 1:200 so for 1000 ONE you got 200000 OFC. That does not mean you will have 200000 ONE, the rate OFC:ONE will be known after October 08.2018, right now we do not know. We can only hope it will be 1:100 so we end up with double Onecoins. but the ofc were for the IPO, are they also valid for the ICO? Thank you for confirming what I had hoped to understand! IPO seems to be canceled cause it would be hard for so world spread people to own and trade stocks, legally but also this is fintech company pivoting around cryptocurrency so they decided to go ICO but this is delayed because of the ongoing investigation. So, OFCs are not future tokens that we will be able to exchange back to ONE after public exchange launches after October 08. 2018. And ONE we will be able to use at merchants and probably sell to FIAT as time goes by. Acting this way does not promote confidence in OneCoin. Ok so you ask why did dr Ruja Ignatova register the domain as private? First, you know her full name why do you ask why the domain is private? 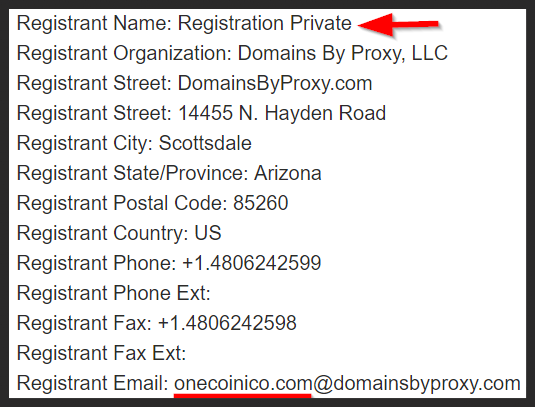 OMG it is private, I will not invest there cause DAN LARIMER registered the domain as private. DAMN, it is private, I will not invest cause CHARLES HOSKINSON registered the domain as private. Companies register domains as private as a legal precaution abundance since all this is not yet regulated and you can never know how authorities will deal with crypto projects at the end. No, you misunderstood. OFC will exchange to ONEcoins, and ONEcoins will be able to be spent at merchants, or sold on exchange for fiat money. Thank you Igor that is what I had understood but in your earlier quotes I misinterpreted your explanation. I have no intention of using or seling; seeing Onecoin's future grow will be exciting.